THIS WEEK, A Labour MP was ejected from the House of Commons for the rest of the day after taking the ceremonial mace in what he said was a “symbolic protest”. The incident grabbed people’s attention (and attracted some ridicule) as a bizarre way of displaying frustration with the UK parliament, and Brexit. Any debates that are carried out without the mace in place are illegal. The incident also brought a focus on the mace itself, which symbolises royal authority, without which the House cannot meet or pass laws. So what other traditions are in the House of Commons, and where did they come from? An MP is kidnapped during the Queen’s Speech given during the State Opening of Parliament, which is a ceremony that showcases British history and politics. An MP is chosen at random to be kidnapped during the Queen’s Speech (traditionally it was the Vice-Chamberlain) and is released upon the safe return of the Queen. The tradition is based on what was once meant to be a guarantee of the monarch’s safety as he or she entered a possibly hostile Parliament. It stems from the reign of Charles I, who had a contentious relationship with Parliament and was eventually beheaded in 1649 during the Civil War between the monarchy and Parliament. The Black Rod is another interesting House of Commons tradition – it’s not a staff, but a staff member. The senior officer in the House of Lords is responsible for maintaining the buildings, services, and security of the Palace of Westminster. During the State Opening of Parliament (the same thing that sees an MP kidnapped), he bangs on the door of the Commons chamber with a black rod. The door is customarily slammed in his face to emphasise the Commons’ independence. After three rounds of banging, he’s then let in. The title ‘Black Rod’ comes from an ebony staff topped with a golden lion, which is the main symbol of the office’s authority. In February this year, the Queen appointed the UK’s first female Black Rod, Sarah Clarke. The Speaker of the House, or the referee between the government benches and opposition parties, who ensures each person gets the appointed speaking time, has to go through a bizarre process when they’re appointed. They have to pretend that they don’t want to be chosen and are “dragged” by MPs to the Speakers bench. This is rooted in the Speakers’ traditional role of briefing the monarch on the goings on of parliament, and potentially facing their wrath. A candidate has to be nominated by at least 12 members, of whom at least three must be of a different party from the candidate. Unlike the Dáil, there is no running order in the House of Commons. 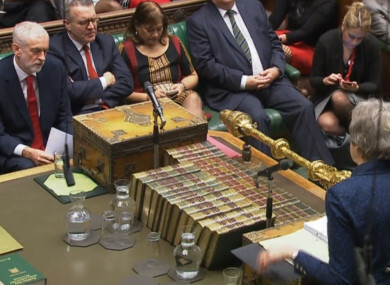 Instead, MPs have to be called by “catching the Speaker’s eye”: that means rising or half-rising from their seats in a bid to get the Speaker’s attention. And, while we’re here, what’s with those in the House of Commons calling each other “right honourable”? MPs who hold no ministry are referred to as “the right honourable member”, but as “my honourable friend” if they are in the same party. “Right” means “to a great extent or degree” in this context. Email “From kidnapping to the Black Rod: Here are some weird House of Commons traditions”. Feedback on “From kidnapping to the Black Rod: Here are some weird House of Commons traditions”.